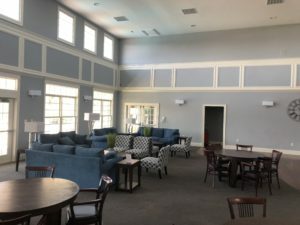 The clubhouse is available to all members of the community to use and contains the club room, conference room, gym/fitness rooms, and the community library. The club room is available for rent by homeowners for parties and gatherings. Please review the rental contract posted below and the calendar for available club room dates. View clubhouse rental agreement. Club room. Girl Scouts Troop 4911. Kitts Creek would like to welcome you to a community service club for Tweens and Teens (age 10 – 18) that live in Kitts Creek Neighborhood. This will be a great group for young people to brainstorm, plan and work on ideas that positively impact both our nearby and global communities. Mix and mingle will be from 8:30 – 8:45 AM and the meeting will start promptly at 8:45. Ongoing meetings will be on the 2nd and 4th Saturdays starting on March 11 at the same time and place. In the Tweens and Teens Community Service Club youth are empowered to work together and give back. I hope to see you there! If you have questions, or are an adult that would like to be involved, please email cindee775@gmail.com or Facebook message Cindee Hand Hakim. spoke with homeowner on 3/15. Does not need rental.